Going off-grid has a lot of perks -- but it also has a number of disadvantages. If your RV tires get flat, it’s up to you and the tools available at hand to fix or replace it. Without such knowledge and the proper equipment, you’ll likely be stuck in the vast emptiness for a while. That’s why we aim to list the best portable air compressor for RV tires for off-gridders like you. 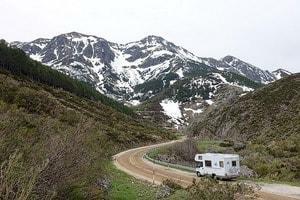 An RV is the best choice for living off the grid. RV tires are built for durability and rightly so. Most often, an RV serves as a “home on the road” where people travel around the country for days or weeks on end. An RV serves as their home as well as their means of transportation. They’d traverse miles and miles of endless roads, sometimes smooth and sometimes rough in order to reach their ultimate destination. That being said, an RV tire should last long and should be able to withstand daily use. However, it is not impossible for RV tires to get flat, although this happens mostly to older RV tires or when the terrain is extremely rough and isn’t suitable for an RV tire. Deflated tires aren’t a new thing, but when you’re off the grid with more land than establishments, it’s better to learn how to fix the problem and have a handy portable air compressor for RV tires. If you’re buying an RV for a long road trip, it’s better to get armed with an RV tire inflator in case you get stuck somewhere with no garages and gasoline stations. But remember, some inflators aren’t suitable for the needs of an RV tire. To find what you need, here are some factors you should consider when buying a portable air compressor for RV tires. PSI means pounds per square inch -- the rating of how much pressure a tire could handle. It is also the total pressure the tool can fill into. When you are choosing a portable air compressor for RV tires, you need to check whether its maximum PSI is high enough pressure to fill the tires. Nonetheless, PSI calculation for RVs is a little tricky because each wheel carries a different load. That means you have to calculate each pressure of the tire depending on the load they carry. You should look into what you’re carrying each time you use your RV. The equipment and stuff you put in it could help determine each wheel’s load. Usually, you can find the needed information on the door jamb of the driver’s side. When buying a portable air compressor for RV tires, it’s better when you can see the active pressure of the tire. This helps you know whether you’re filling it up just right or you need more. These pressure gauges could either be analog or digital. If you find it difficult to read analog types, a digital one would be the best fit for you. You also need to test it out, if possible. The accuracy of the gauge will make or break the RV tire inflator. Inaccurate readings could lead to high or low pressure which affects your tires’ performances. There are two main power sources for a portable air compressor for RV tires. First is when you plug it into a cigarette lighter and the other is by hooking it to your RV battery with a pair of 12-volt connection or what looks like jumper cables. You can choose which of these are easier for you. There’s also the consideration of whether your RV is bigger or smaller. If you opt for the jumper cables, a longer cord will be a better choice. 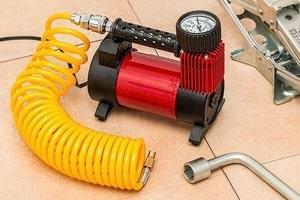 Finding the right portable air compressor can help fix a deflated tire. CPM or cubic feet per minute pertains to the compressor’s air flow rate. If you want your tire to fill up faster, you should get an air compressor with a higher CPM rate. Perhaps the most essential consideration is the size and the weight of the compressor. As a portable equipment, it should be easy to bring along with you. But that doesn’t only mean it should fit within your RV and store it without using too much space. This should also mean that you can carry it around effortlessly from tire to tire. Choose a compressor that weighs around 10 to 15 pounds and won’t be too bulky to carry so you can effortlessly carry it around and do the work on your own. The horsepower pertains to the maximum power of the engine. Buying portable air compressor for RV tires that have a higher horsepower will give you more strength, making it perform better than portable air compressors with lower horsepower. However, since you are opting for a smaller and more compact tool, you can’t expect to see a 100 HP one. Some air compressors for RV tires have additional features that make it work better or perhaps, save it from damages. One of these features is the automatic shutoff. Some air compressors include this feature to prevent overheating and any damages that come with running too long. Speaking of overheating, the runtime of an air compressor is also an important factor. Does it overheat a few minutes after it was turned on? If it does, it’s really not worth it at all. When finding a portable air compressor, it should at least be able to fill up the tires of your RV in one seating before you can recharge it again or before it heats up. If it’s also has a higher CPM and a faster inflating time, then it can likely stay running a bit longer. Although never let it running on when not in use to preserve its battery and its life. Lastly, find a portable air compressor for RV tires that is within your budget. If you can splurge a little and buy a more expensive one but with better quality and performance, the better. Basically, the best option is an air compressor that has all the features you need, excellent quality, and within your budget. Of course, you can always save up money first to buy what you want. The important thing is you have this tool before you go on an off the grip trip. 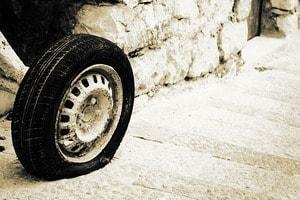 Deflated wheels are common on the road but can be a problem. The overall performance of this compressor is good. With a 2.0 SCFM at 90 PSI, you wouldn’t have to wait long before it can recover and you can use it again. It includes an oil-free pump inside so it requires little to no maintenance at all. As size and portability go, it’s a 20-pound air compressor with a handle for hand-carrying so it’s rather compact and can be easily carried around by a single person. With thanks to its long hose as well as the inclusion of accessories, you will likely find anything you need for that RV tire job. However, it does have a minor issue with the noise. Although 79 dBA is not necessarily loud, it definitely isn’t quiet either. There is also some issue with its balance since the little rubber feet can’t seem to carry the weight of the tool. Nonetheless, for its price point, it packs some good power that does its job at inflating tires well. When it comes to inflating RV tires, this has a good track record for fast inflation. It caters well to other off-road wheels as well as normal cars so it’s basically an all-around air compressor. The accessories that come with it can make life easier as you’re filling the tires. The 33% duty cycle means that it can run for around 20 minutes which isn’t a lot of time if you look at it. After running for at least 20 minutes, it will start to heat up and then its automatic off function will kick in to prevent overheating and damages. But the duty cycle isn’t actually a problem, especially when you can finish filling up a tire in less than 5 minutes. It’s also rather quiet which makes it a suitable choice for those who like noiseless machines. For its price, you’re going to get a long-lasting machine that does the job well and is rather compact when it comes to size and weight. This air compressor runs on a car battery and the engine should be on while to use this portable compressor, so you have to use this compressor with caution. With 33% duty cycle, it only lasts around 20 to 40 minutes before it overheats and the auto off function works. However, it is able to fill up smaller RV wheels rather fast, usually less than 5 minutes each wheel. Included in this air compressor is a 5-in-1 inflator/deflator inline pressure gauge. It is pretty easy to read and an accurate one, at that -- which is essential. It also comes with a free bag for easy storage and makes it easier to bring along with you. Plus it contains an anti-vibration tray that you can use when working. Overall, this is a compact and reliable air compressor although the requirements on using it does put some people off. However, you can avoid any untoward incident by making sure it’s properly used and turned off when not in use to avoid overheating. GSPSCN tire inflator boasts being able to inflate a regular tire in 1.5 minutes. Bigger tires may take more time, but usually under a 5-minute mark making it a reliable choice when it comes to faster tire solutions. When using, the product recommendation is turning your vehicle’s engine on so that it can work faster as it increases power. That being said, caution is important when using this. For its overall performance, it works well and does the job without leaky nor low-pressured tires of any size or kind, thanks to its direct drive motor with its low rotating speed that can prove to be powerful. This product has a smooth run and is rather easy to store with its portability. It weighs around 6.8 pounds which can be a little heavy but still easy to bring as it includes a bag. It includes multiple nozzles to make sure it caters to various tires. Additionally, the rubber feet guarantee it does not make a lot of noise and does not vibrate too much. Off-roading is one of the most exciting adventures you can take when you have an RV. But if you face a flat tire in the middle of nowhere, it is best that you have the best portable air compressor for RV tires. This ensures you can fix the problem in no time and continue your adventure.